Flintlock pistol, Juan Santos, Madrid, dated 1742. Octagonal barrel, round after a cut baluster, with smooth bore in 14 mm calibre, a cannon muzzle and a gold-bushed touch hole, at the breech gold-inlaid marks, floral decoration and the signature "JUAN SANTOS EN MADRID ANO 1742" (Stöckel No. 982 and 983). 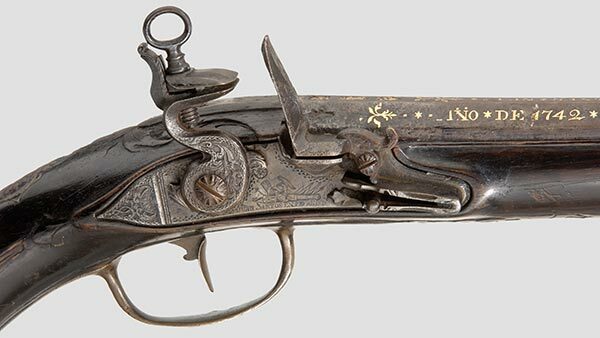 The flintlock with finely chiselled floral decoration, the signature repeated and a date on the lockplate. Lightly carved, darkened wooden fullstock with chiselled iron furniture. Wooden ramrod with iron tip. Length 56 cm. Juan Santos, Madrid, recorded 1721 - 56, did his apprenticeship with his father, Luis Santos.